There comes a time every year when we start to get really excited about all the things we can roast and all the different hearty dinners we can make that warm us up and keep us feeling good…and this dish is no exception! Butternut squash has just the right touch of sweetness and basically goes great with everything. Here, we browned up some sausage and sauteéd a bunch of fresh veggies…then we threw it all into a freshly roasted squash (psst, don’t forget to top it off with cheese!) and dug right in! You can tweak this dish any way you like – gotta love customization – so it really does make for a perfect family dinner! Cut butternut squash in half and scoop out seeds, then brush with olive oil and season generously with salt and pepper. Place squash cut side down on a large baking sheet and place in oven. Bake for 35-40 minutes, or until fork tender. 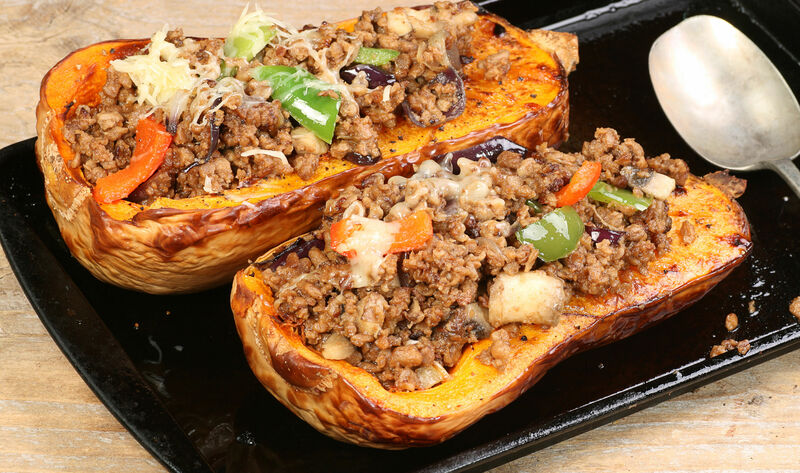 While squash is baking, cook sausage in a large pan or skillet over medium-high heat until browned on all sides. Use a slotted spoon to transfer sausage to a bowl, then add bell peppers, eggplant and onion and sauté until softened. Add mushrooms and garlic and cook for another 2-3 minutes, or until fragrant. Return sausage to the skillet and stir everything together. Transfer sausage and veggies to a large bowl and set aside. Remove squash from oven and, once cool enough to handle, scoop out a little of the centers (to make space for the filling). Stuff squash halves with sausage veggie mixture, then top with cheeses. 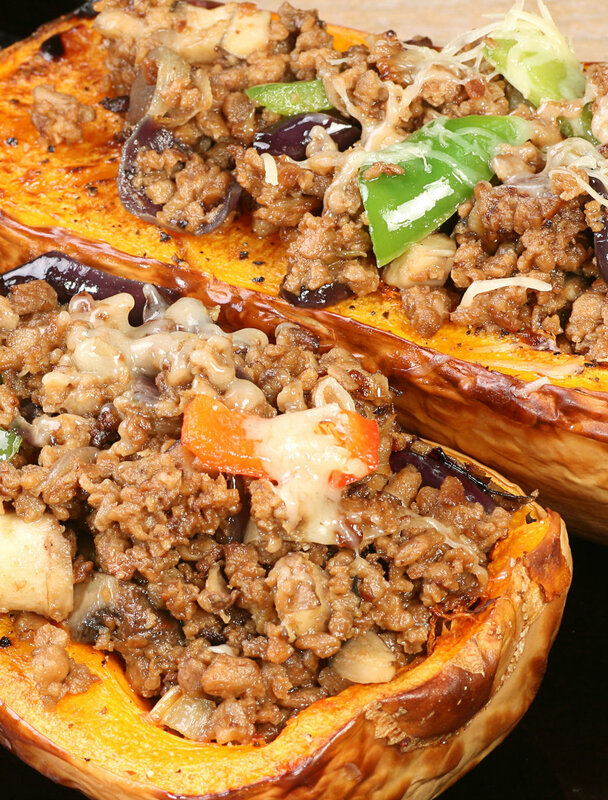 Return squash to oven and bake for another 15-20 minutes, or until cheese is melted.